1. King of Hazor; head of one of the great confederations which faced Joshua in his conquest of Canaan (Josh. xi.). He summoned his allies from every side, including the Amorites, Hittites, and many petty kingdoms. By "the waters of Merom" the battle was fought, and the great coalition, notwithstanding its chariots of iron, was defeated. Joshua took advantage of his victory, captured the royal city Hazor, and slew Jabin, its king. He thus conquered territory that was finally divided by lot among (at least) Asher, Naphtali, Zebulun, and Issachar. 2. King of Canaan "that reigned in Hazor" (Judges iv.). Some regard Josh. xi. and Judges iv. as referring to one and the same event. This Jabin appears as an oppressor of Israel for twenty years, whose most formidable instruments of war were nine hundred chariots of iron. Israel arose under the inspiration of Deborah and Barak to throw off this yoke. Jabin's army was in charge of Sisera, his commander-in-chief, who afterward fell in the tent of Jael the Kenite. 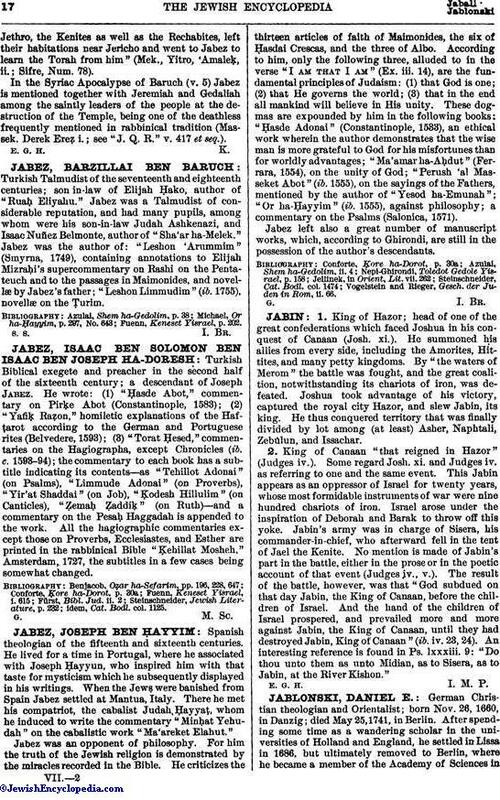 No mention is made of Jabin's part in the battle, either in the prose or in the poetic account of that event (Judges iv., v.). The result of the battle, however, was that "God subdued on that day Jabin, the King of Canaan, before the children of Israel. And the hand of the children of Israel prospered, and prevailed more and more against Jabin, the King of Canaan, until they had destroyed Jabin, King of Canaan" (ib. iv. 23, 24). An interesting reference is found in Ps. lxxxiii. 9: "Do thou unto them as unto Midian, as to Sisera, as to Jabin, at the River Kishon."